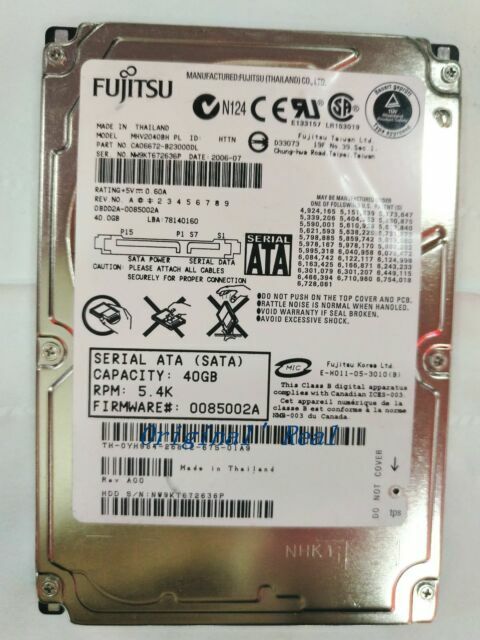 Fujitsu MHW2040BH is an HDD (Hard Disk Drive) with 2.5" form factor. Featuring 40 GB memory capacity, the MHW2040BH model provides storage space for the user's data. The device connects through SATA interface and has a spindle speed of 5400 RPM, ensuring efficient operation. This disk is designed for Notebooks and has 8192 KB buffer size. The Fujitsu hard drive's dimensions are 0.37-inch height, 2.8-inch width, 3.9-inch depth, and its weight is 0.22 lbs. performs as needed for consumer level needs. 5400 RPM is not fast enough for commercial uses. Size is good for home use or experimental installations of operating systems (which is what I am using it for). i dont even try them yet cause they not the kind think they were.i think they have 44 pins this was the reson i bought the itm.